PT Dana Tabungan dan Asuransi Pegawai Negeri (Persero) - PT TASPEN (Persero) or referred to as "TASPEN" is a leading state-owned social insurance company in Indonesia with operates primarily as a social insurance provider of Civil Servants (PNS) in Indonesia. TASPEN was established as a state-owned company under the Government Regulation No 15 of 1963. As a state-owned company, PT Dana Tabungan dan Asuransi Pegawai Negeri (Persero) is fully-owned by the Government of Indonesia. 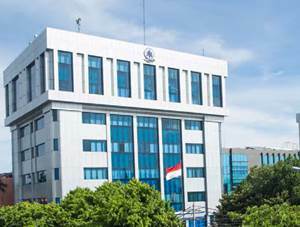 Headquartered in Jakarta, TASPEN runs its business through 6 main branch offices, 44 branch offices and 13,233 service points spread across Indonesia. In terms of financial performance, TASPEN posted positive financial performance in 2014. According to PT Dana Tabungan dan Asuransi Pegawai Negeri (Persero) annual report 2014 as cited by JobsCDC.com, TASPEN managed to record a total revenues of Rp 20,252.04 billion at the end of 2014. This total revenues figure equal to an increase of around 16.16% compared to Rp 17,434.40 billion at the previous year. Total net income went up by 160.21% from Rp 1,324.29 billion in 2013 to Rp 3,463.97 billion. Minimum background in Bachelor Degree (S1), majoring in Law, Computer Science, Accounting, Conomics, Business, Communication, Statistics, Civil Engineering and Medical Science. Maximum age of 25 years old (S1 Law, Computer Science, Accounting, Conomics, Business, Communication, Statistics, Civil Engineering) and 28 years old (S1 Medical Science) on 31 January 2017. Minimum background in Diploma Degree (D3), majoring in Accounting, Computer Science, Taxation, Marketing, Electro ENgineering, Library, Archieve, Civil Engineering, Nursing/Health and Secretary. Maximum age of 24 years old (D3 Accounting, Computer Science, Taxation, Marketing, Electro ENgineering, Library, Archieve, Civil Engineering, Nursing/Health) and 7 years old (D3 Secretary) on 31 January 2017. Single and willing not to get married for 2 years. Certificate has followed the interensif program. JobsCDC.com now available on android device. Download now on Google Play here. Please be aware of recruitment fraud. The entire stage of this selection process is free of charge. PT TASPEN (Persero) - D3, S1 Management Trainee, Non Management Trainee TASPEN January 2017 will never ask for fees or upfront payments for any purposes during the recruitment process such as transportation and accommodation.